The main property of the amulet is to protect the person who owns it. Protection against evil spirits, dangerous magic and unfavorable events in life. Amulets also serve to attract, collect goods and provide (prosperity, well-being). Amulets remind us of what we want and their daily presence close to us, I remind us of the importance of our issues. Depending on your intentions, you may have different amulets in your personal situation. The most important thing is that it is faith in their sprawczość and consistent with their intentions to act. What are the forms of amulets? They usually take the form of personal items, worn close to each other. As to shape-limits us only imagination. From the tattoo, through the pendant, to the rings. The most important thing is power. The Amulet or talisman has a personal dimension. 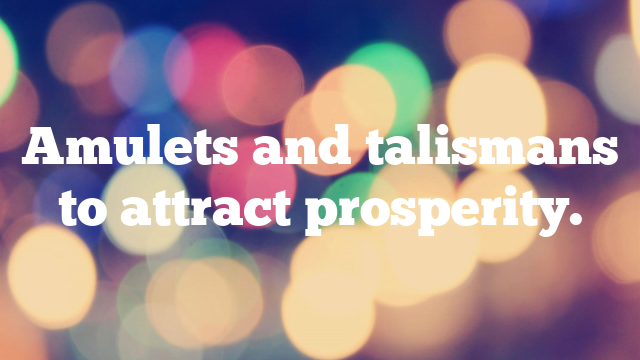 The history and symbolism of talismans. Depending on the region, it believes differently, but in the same way. In China, it is fortunate to have bamboo. The bamboo container is usually placed in a room located in the south-east of the house. In India, the symbol of happiness is the elephant. However, it is important to note that if we want the elephant to be valid, it would be raised to be up. An elephant with a abandoneding trumpet will not bring anything positive. Do you want to create something of your own and not repeated? Inspiration will come to you alone. You just have to watch the environment, listen and watch. Do not run out of fantasies and patience, materials are less important. Pay close attention to items that are spontaneously caught in your hands – you find them on the street or you get a gift. It can be anything, so we do not overlook anything, and we observe whether a particular item will speak to us. The most important thing is intuition and the conviction that we can contribute to something. If we want to make an amulet of specific purpose, we focus on the search on a specific type of objects. For example, a coin, a citrus pendant (especially lemon or orange) and some stones may be an amulet for attracting luck in business. When we are already satisfied with what our amulet looks like, you must give it a character – tune with you, adapt to our needs and our personal vibrations. To clean it from the old energy, simply rinse under running water or leave it to the sun. Once you have rided the old energy, we begin to charge it with your vibrations, holding in your hands after a few minutes a day. By holding it in your hands, you should imagine something that we would like to experience. If this task seems to us to be difficult-we have no confidence in our intuition and creative capacity, we can choose to follow the need and buy or here the pendant with runą or magic symbol, or a stone with specific properties or mantra. If we take care of him properly, such an amulet will serve us and act.